Saturday might hold more of the same, but on Sunday, the Tour finally starts in earnest. The breezy roads of Brittany and the Val de Loire will suddenly give way to some of the harshest terrain Europe has to offer when the peloton rides across the cobbles from Arras to Roubaix for Stage 9. 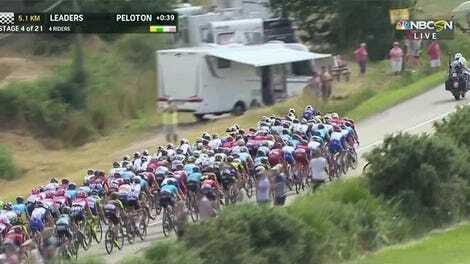 If the first eight stages of this race have been about control, perfection, and avoiding a modicum of risk, Stage 9 will be the Tour’s first injection of good old-fashioned chaos. Nobody will call it boring. Thus far, the relative positions of contenders for the yellow jersey have only been determined by bad luck or the help they had during the team time trial. There will almost certainly be time gaps after Sunday’s ride, simply because the road is too hard to ride on to expect anything resembling the boring cohesion that’s defined the first week of the race. The stage includes 15 sectors of cobbled roads totaling 21.7 kilometers, the longest of any of the Tour’s last five cobbled stages, and some of Paris–Roubaix’s most famous sections like the Camphin-en-Pévèle will feature on Sunday. The cobbles are nasty as hell to ride on, and the constant threat of a crash or a breakaway makes for some very entertaining cycling. 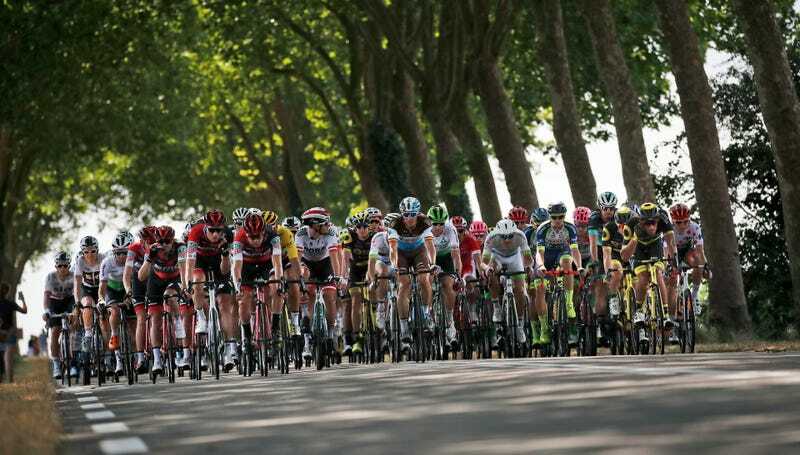 Skinny general classification contenders and climbers are not suited for these roads, and watching favorites like Chris Froome, Nairo Quintana, and Richie Porte navigate the pavé with the help of their teams will be fascinating. Weather forecasts show that it will be sunny and warm on Sunday, which means mud won’t play a factor, though the cobbles can get dusty and slippery in the heat. Cycling Weekly recently rode the cobbles to show you what it looks and feels like. The last time the Tour de France featured cobbles, during the 2015 race, nothing happened. Alberto Contador punctured, but he recovered. However, in terms of course composition, Stage 5 of the 2014 Tour is a better analogue to the 2018 cobbled stage, and that race was one of the nuttiest Tour stages of the decade. Chris Froome had to abandon after falling twice, Alberto Contador lost minutes, scores of riders hit the deck, and Vincenzo Nibali sealed his yellow jersey early with a beautiful performance. Neither of those two stages featured as many cobbles as this weekend’s does. And it’s not just the physical demands of riding cobbles that could make Stage 9 one a classic stage; it takes a great deal of mental strength to play the inhospitable terrain correctly. Nobody wants to be caught out by a crash or a mechanical, so the entire race will be a pitched battle to establish position at the front. Teams will do everything they can to keep their stars out of the fray, though not all of them will succeed. “A cobbled stage in the Tour is definitely way different than going into Roubaix, it’s way more nervous,” John Degenkolb said. The Tour de France should, ideally, test riders in as many ways as possible. It’s not as interesting when the race comes down to who has the better team and who can climb better. Cobbled roads mix it up, and this weekend, we’ll find out who’s ready to stake their claim on this Tour.